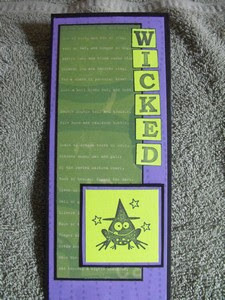 Today’s card is a play on the production ‘Wicked’. I love the frog stamp. Don’t you think he’s cute? I like to include links to the original artist’s page whenever possible. However, I could not find one for this Diane Jackson (Ponte Vedre Beach FL). If you know her, please let her know I thank her for her inspiration. Diane used a black base with a purple print panel. Then a smaller white panel and a grape vine/ word patterned paper. Where I have WICKED, she spelled out CELEBRATE on white. My adorable frog replaces her cluster of grapes. I loved her card but needed something for my Halloween post. It was nice to go down to the studio before the sunrise this morning and work. I'd love to spend the whole day there but panic calls from my daughter have begun so who knows how long I have. For now, I have a card for Chip. Chip has had some serious foot issues resulting in adjustments to his life and passions. You can read Chip's story HERE . One thing Chip does enjoy is fishing. So I created a small lake with a 'no limit' option. Chip can relax and enjoy a long day of drowning worms. I used the masking technique to create a bank and lake full of fish. I chose the pine tree background from Noble Deer (retired SU), LePlume markers in green tones. The sky and lake colors were created using SU chalks. Those little fish swimming just below the surface are actually small fish buttons from Jesse James themed buttons. It looks like Chip's already snagged a big fish (Mike's $1). I used an actual fishing hook and line. Here's wishing Chip a speedy and full recovery so he's home with his family soon! 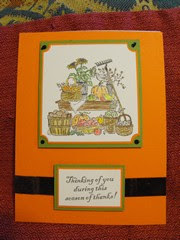 This week’s card covers Magazine Monday and the September challenge from the Paper Bloggers Unite! Thread at SU. I chose Elizabeth Allen’s card from Crafts n Things Oct. 2009. You can see another of her cards at Penny Black. I also hope you’ll take time to check out their website and browse their catalog. I liked Elizabeth’s LO, though I did eliminate 1 layer from hers to create mine. Where I have black stickles, she used black brads. I used SU Very Vanilla and Old Olive and ValuCS Orange. The SU Seasons of Thanks images were stamped in Memento Rich Cocoa. Back to watercoloring with Derwent watercolor pencils and Crayola colored pencils. I used a rich chocolate velvet ribbon for some texture. Yep... I'm on the ball today. 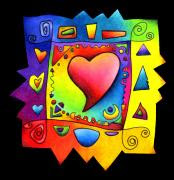 This week's card destination is to a lady in Painsville OH (so appropriate at the moment) who has several foot surgeries and is unable to travel to Arizona to see her granddaughters. It sounds as if it is something she was doing on a regular basis until this whole foot thing started. Sharon loves Purple and Hydrengias. I had plenty of purple on hand but the prettiest flower (other than my favorite Stipple Rose) I had to work with was this Iris I got from a recent image swap. 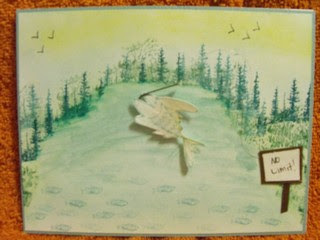 My inspiration came from artist AJ Otto's card in the Fall 2011 issue of Paper Creations Magazine (pg 55). AJ did a Halloween themed card but I really liked the layout. Where I've used the strip of DP, AJ had used some black scroll work tucked under the top left corner of her image mat. She also did not mat her sentiment and I added the pearls. 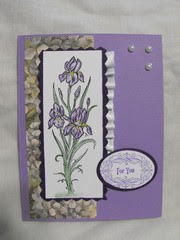 I used Lavender Lace as a base and matted the flower and sentiment with ValuCS deep purple. The sentiment is stamped in Lovely Lilac. Derwent Water color pencils were used to color the image and a white ribbon, pleated, softens the look. 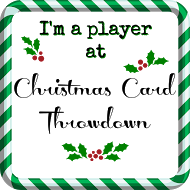 I'm about done crafting for the next couple weeks. 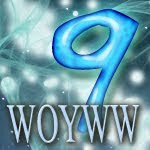 I have cards done up so that wherever I am, I hope to be able to upload and keep on track. It seems like it's taken me forever to get to this point. And, granted it's Monday evening before I'm getting the card up... let's just say life still isn't slowing down. I'm like an expectant father every time my phone rings or I get a text message I fear it's my daughter telling me to head for Nashville. Yep, we're still waiting on the granddaughter. But technically she isn't due to make an appearance til around the 14th, so we have some time. an kit swap I'm in at SCS, it just seemed to fall together. 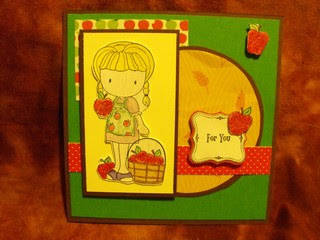 Oh yeah, and my challenge on the Stamp2Spend thread at SCS this week was to incorporate APPLES and CINNAMON... but the cinnamon had to be done in such a way that it scented the card - like a scratch n sniff. I think it's the energy-saving bulb that gave this a yellow cast. It really is Very Vanilla. The image is from The Greeting Farm as are the apples. I water-colored the image with Derwent watercolor pencils. I colored the apples red and embossed them with a mix of Red Tinsel embossing powder and ground cinnamon. The image and the apple paper in the upper-left corner were from the kit swap, everything else came from my stash. The only thing I did different from Michele is where I have the all green background, she used 2 different DP papers in a top half, bottom half LO. 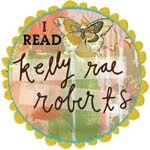 She also used a vanilla strip where I have the polka dot and the sentiment was stamped directly onto it. I raised the image, vintage label and the apple in the upper corner with pop dots.